Join us and the Jumbo Creek Conservation Society for a presentation from Clayton Lamb on grizzly bears and the JCCS AGM. Clayton Lamb, Grizzly Bear Biologist. Wild and mountainous British Columbia is home to one of the largest grizzly bear populations in North America, with about 14,000 bears. But these bears face many threats, especially in the southern part of the province. 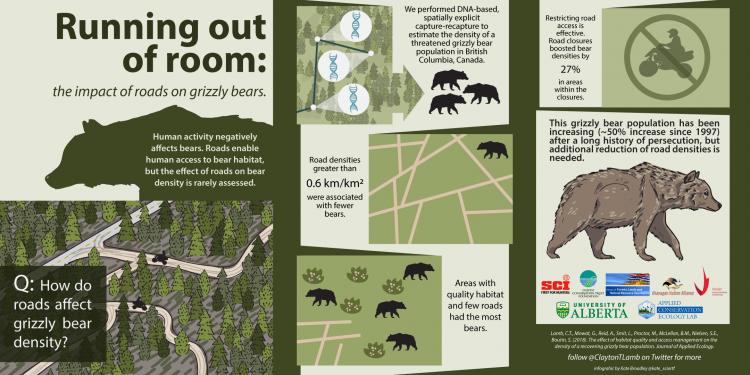 Clayton Lamb’s research team investigates the complex relationships between bears and human land use, human-caused mortality and habitat factors like food supply. Their work, conducted across large tracts of land, speaks to both local issues and regional concerns. Clayton’s presentation will focus on two case studies on grizzly bear population dynamics in the Rockies: 1. the effects of habitat quality, road density and access management and 2. the impacts of high mortality and attractive food resources on bear populations.